Fracture is the braking of a metal to yield an irregular surface. The topography of the fracture surface is the important characteristics intimately connected with the crystalline form and in some cases it may give an indication of purity of metal. Inter granular fracture by separation of crystals at the grain boundaries. Fracture due to shear between the crystallographic planes. Cleavage fracture through pulling a part of crystallographic plane. 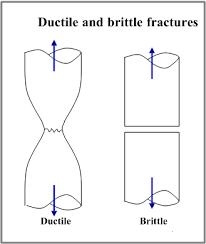 In the case of Ductile fracture there occurs an appreciable plastic deformation prior to failure and the fractured surface gives cup and cone appearance (shown in Fig.) 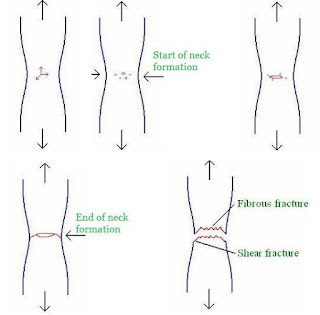 The fracture is found to start only after a necked portion shown on the test piece. The first formed micro-cracks and cavities grow large and finally join together to form a crack in the centre of the necked portion. The cavity then spread in direction inclined at 45° to the tensile axis. The size of the cup depends on the relative shear and cleavage strength values. Metals with high yield strength give a smaller cup. The fracture faces are dull, irregular fibrous in appearance. 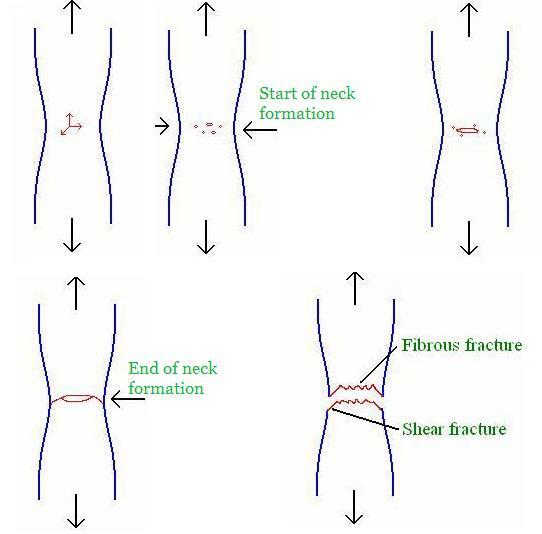 Different progressive stages of ductile fracture are shown in Fig. In case of brittle fracture failure of the metal occurs when the fracture crack propagates through the cross-section without an appreciable plastic deformation. The fracture crack may start from any location where there are stress raisers. The surface condition of the metal can be critical and markings on it can initiative cracks. Such a fracture is more likely to occur in metal with poor plasticity and low temperature.